Sensitive documents obtained by The Maroon last summer and a new lawsuit reveal a strained relationship between the University and the Pearson family, calling the future of the Pearson Institute, which was supposed to change the world, into question. The Pearson family receives a standing ovation at an event in September 2015 announcing their gift in Mandel Hall. Then-Harris Dean Daniel Diermeier, to their left, is also clapping. In the fall of 2015, University of Chicago president Robert Zimmer made a surprise announcement to a packed audience at a formal event in Mandel Hall. Flanked by sleek graphics and illuminated by camera flashes, Zimmer said that the University had received a $100 million gift—then the second-largest donation in its history. The widely-covered donation was made by Thomas L. and Timothy R. Pearson on behalf of their family. The brothers, neither of whom had ties to the University, donated the money to establish the first research institute of its kind at the Harris School of Public Policy. The Pearson Institute, as it was called, would aspire to recruit world-class scholars who would produce groundbreaking research used to design and implement policies that would reduce conflict around the globe. It was an extraordinary accomplishment for then-Harris Dean Daniel Diermeier, one that would be cited when he was appointed provost six months later. On February 20, however, the much-hyped Institute’s status and future were publicly put into doubt as the Pearson Family Foundation sued the University of Chicago for $22.9 million—the total value of the installments of the gift it had given to the University thus far—in the United States District Court for the Northern District of Oklahoma, making it one of the largest lawsuits of its kind in recent memory. The suit was a culmination of a year-long conflict, according to sensitive documents obtained by The Maroon last summer. In the suit, the Pearsons declared that they had lost all confidence that the University would be “an appropriate or capable steward of the Pearson Family legacy” as it had allegedly failed to fulfill several key contractual obligations that were agreed upon when the gift was made. These included the University’s hiring of an institute director who allegedly recruited underqualified faculty due to favoritism, its insistence on participating in a Catholic conference that celebrated heterosexual marriage instead of hosting a required academic forum, and Diermeier’s purported unwillingness to act as a steward of the Pearsons’ grant. They also allege that the University persistently engaged in deceptive and bad-faith behavior in the relationship. A spokesperson for the Pearson Family Foundation would not comment on the record about specific allegations, but said in a statement to The Maroon that the Pearsons’ story should lead other philanthropists to rethink donating to universities. The University, which has yet to reply to the suit in the Northern District Court, provided a statement to The Maroon that denied that the Institute was floundering, and stated that the Pearsons’ complaint was baseless. The Pearsons are no strangers to lawsuits regarding their philanthropic contributions. In 2011, Thomas Pearson sued Garrett-Evangelical Theological Seminary, his father’s alma mater, alleging that a $1.2 million gift made in their name to the Methodist seminary had been misused. The United States District Court for the Northern District of Illinois ultimately ruled that the Seminary had respected the terms of the contract and dismissed all of the Pearsons’ claims. The Maroon first learned about the conflict between the Pearsons and the University when it obtained 66 pages of internal University documents last summer. The Maroon decided not to publish or mention the Pearson Institute documents, which were marked “privileged and confidential attorney-client communication,” in order to avoid escalating a still-nascent dispute. With litigation now moving forward, The Maroon deemed the documents newly newsworthy as they, along with the Pearson Family Foundation’s complaint, outline the events that led to the lawsuit. In January 2014, the Pearson brothers approached the University to discuss the possibility of providing a large grant to create an institute to rigorously study global conflicts. The brothers reportedly looked at a dozen universities to host the Institute, but they ultimately selected the University of Chicago because it was a premier academic institution with a reputation for rigorous data-driven research. 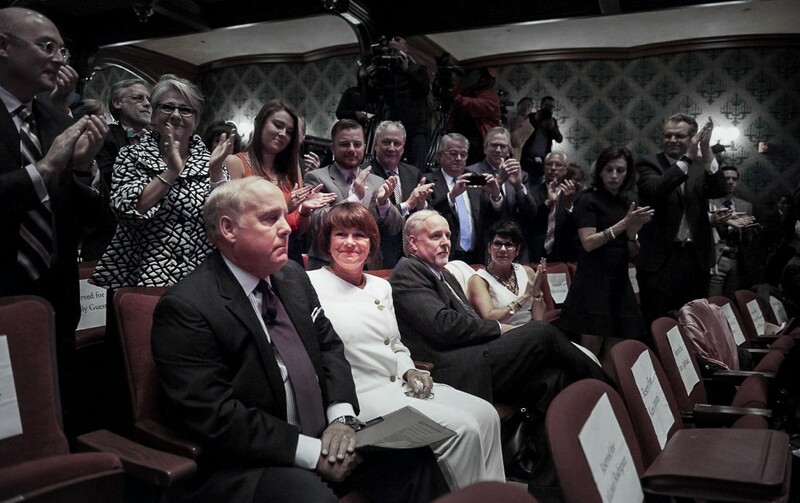 After over a year of negotiations, co-led in the later stages by Diermeier, the Pearsons and the University signed and executed a grant agreement on April 3, 2015, a contract that stipulated the obligations of both parties surrounding the $100 million donation, which would be paid out in installments. 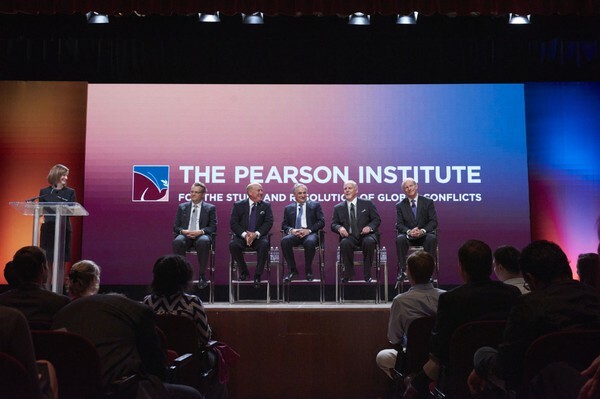 After announcing the Pearson family gift, a panel including (from left) then-Harris Dean Daniel Diermeier, Thomas L. Pearson, President Robert Zimmer, Timothy R. Pearson, and Council on Foreign Relations President Richard Haass participated in a Q&A. The grant agreement required the University to appoint an institute director by September 1, 2016, who would, according to the Pearsons’ complaint, manage its day-to-day operations. 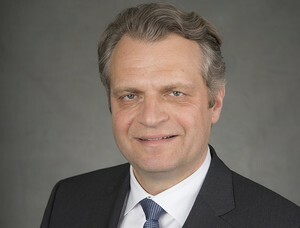 In June of that year, the University appointed professor James Robinson, who had moved to Chicago from Harvard in 2015, as the Pearson Institute’s faculty director. The University press release announcing Robinson’s appointment said that “An internationally recognized executive director, who will be responsible for the overall activities and initiatives of The Pearson Global Forum, is expected to be announced in the near future.” No new director has been announced for the Institute since that statement was issued. The Pearsons further alleged that the University admitted to them that Robinson was not interested or capable in fulfilling the administrative responsibilities required for the institute director role. When the University did not appoint someone other than Robinson to an administrative position by the September 2016 deadline, the Pearsons sent it a notice of default—a document that declares that a party in a contract failed to fulfill an obligation—on June 5, 2017. After the University sent a response several weeks later, the Pearsons told the administration that they would not pay the next $13 million installment due at the end of the month. This prompted the University to send the Pearsons its own notice of default after the deadline. A few days before Robinson’s appointment as institute director, the University also announced that two scholars, an associate professor at Columbia University and an assistant professor at New York University, would assume named full professorships at the Pearson Institute. These hires filled two of the four chaired faculty positions specified by the grant agreement, with Robinson eventually filling the third slot. The Pearsons were unhappy with the hires. They claimed in the complaint that, besides Robinson, the two junior professors were hired despite being inexperienced and underqualified, which they argued undermined the Institute’s goal of becoming a world-class entity. It is unclear which rankings the Pearsons were referencing, but it is possible that they relied on the popular 2018 U.S. News & World Report Best Colleges Rankings—which lists the University of Chicago above both Columbia and NYU. The complaint also alleges that the two junior professors were only appointed to chaired positions because both were “protégés and former students of Faculty Director Robinson.” While the University, Robinson, and the two professors would not comment about this specific allegation on the record, The Maroon was unable to find evidence that the junior faculty members had significant relationships with Robinson. The two professors were indeed students at Harvard University and University of California, Berkeley when Robinson was a faculty member there, but he was not their dissertation advisor. Furthermore, tenure applications are typically approved by the provost at the University of Chicago, not by an institute’s director. Apart from ensuring that the Institute had a world-class in-house faculty, the contract also mandated that the University host an annual “Pearson Global Forum” (PGF) that would convene leading conflict scholars and policymakers from around the world. The University, according to the suit, was obligated to hold the first PGF by October 31, 2018, but said that it could not host the event by then as “it had not planned or done the necessary preparatory work.” The Pearsons alleged that the University informed them that it would attempt to meet this obligation by that date by instead involving the Institute in the 2018 Irish Catholic Bishops’ World Meeting of Families Congress, an event which, according to its website, “brings together families from across the world to celebrate, pray and reflect upon the central importance of marriage and the family as the cornerstone of our lives, of society and of the Church.” The Pearsons said that it found the proposal unacceptable, as this event had its own agenda and purpose. When asked directly whether it had suggested involving the Pearson Institute in this event to the Pearsons as a substitute for the PGF, the University declined to comment. According to the complaint, the University was purportedly cutting corners on budgetary issues as well. The Pearsons claimed that UChicago suddenly informed them in March 2017 that the University thought it had the right to collect many millions of dollars from the Institute to pay for some of the Harris School’s operating costs, which would increase the Institute's expenses by approximately 50 percent. The Pearsons said that by this time, they had already given the University $22 million, which they would not have done had they been aware that the Institute would have to pay these extra expenses. The University again declined to comment. The Pearsons made a number of smaller allegations in the complaint, with many centering around the University’s purported lack of transparency. These included the University changing the number of Pearson Institute scholarships without notice, it not inviting the Pearsons to most Institute events, and Diermeier purportedly failing to adequately “serve as the primary contact for communications” with the donors. With the lawsuit officially filed in the Northern District Court, the University has 21 days to respond, with room for further extensions. The University declined to discuss next steps with The Maroon, but the sensitive documents from last summer as well as similar cases of donor-University litigation provide some clues. The documents obtained over the summer suggest that the University believes it has the option to terminate the grant agreement, as the Pearsons did not, according to their complaint, make their $13 million payment to the University in 2017. According to the documents, termination would allow the University to remove the Pearson name from the Institute after the second anniversary of the date of termination. While still obligated to use all funds previously received for the sole benefit of the Pearson Institute and PGF, the University would not be required to continue to expend University funds to preserve these bodies. One of the documents, an agenda for a June administration meeting, suggested that the University was actively contemplating whether it should “wind down” the Institute as the dispute was escalating. One of the discussion topics on the agenda posed the question “What would a Pearson Institute look like for $22 million we have to date?”. In the statement to The Maroon, the University denied that the Institute was in danger, saying that the Institute “will continue their important and meaningful work with the full support and endorsement of the University.” Shortly after the University provided this statement, Harris Dean Katherine Baicker informed Harris faculty about the lawsuit and reiterated this point. The documents also indicate that the University considered engaging in litigation with the Pearsons. Suing a donor would not be unprecedented, but can be poor optics. Duke sued the estate of a deceased donor for $10 million in 2016 to try to recoup the remainder of pledged donations. It later withdrew its claim after heavy public criticism. Whether the University decides to countersue or not, the documents reveal that the administration anticipated a contentious conflict with the Pearsons, with the family possibly making false public allegations that would require the University to have a clear communications and public relations strategy. What is certain is that conflict between the Pearsons and the University is just beginning. With up to $100 million in both current and future donations, the legacy of a family, and the fate of what was supposed to be a world-changing research institute on the line, the stakes are high. The article originally stated that both junior faculty members named as Pearson Institute professors attended Harvard University as students when Robinson was a professor there. In reality, one of the professors was a graduate student at the University of California, Berkeley when Robinson was a professor there. Robinson later moved to Harvard the same year the other junior faculty member started her graduate program there.